God's words also cut in other ways. In our story today, God commanded the loyal Levites to kill their idol-worshiping family members, neighbours, and friends. What a gruesome, wrenching, horrible day that must have been—humanly speaking at least. The power of faith to divide families should not surprise us. We have all heard of belief traditions in which, if one defects to another faith, that one is no longer considered a family member but an outcast. And such cutting apart will be characteristic of the end times. Jesus prophesied that children would betray parents and parents children because of faith in Him (Matthew 10:21-22, Mark 13:12-13). If faith in Jesus has cut your family apart, know that it's not an unusual thing—though no less painful because it's common. A comfort for people of faith in such families is 1 Corinthians 7:14 which speaks of an unbelieving spouse being sanctified by the believer. Can we claim this promise for other family members as well? I think so. I don't believe "sanctified" means they have salvation per se. Whether or not to believe in Jesus is a decision each person makes for him- or herself. But I do believe it means that they are marked as God's own, and consecrated or set apart for Him. We continue to pray and believe that in due course, He will draw them to Himself. 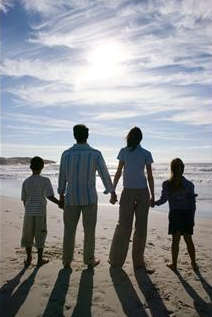 PRAYER: Dear God, it is painful to think that members of my family could be eternally separated from You. Please draw them to You. Amen. Would you say "Imitate me"? Do we insist too much?